I've been sent a recording of a "presentation" made on Tuesday by the great champion of Brexit Boris Johnson over breakfast in Amsterdam. The Conservative peer was the last surviving member of Sir Winston Churchill’s post-war government. From next week we will have a new addition to our wallets, with plastic £5 notes featuring Sir Wiston Churchill set to enter circulation. A phial containing blood, taken from the former Prime Minister as he recovered in hospital from a fractured hip, will be sold next month. Two wreaths were laid on the green marble memorial to Sir Winston Churchill in Westminster Abbey in a private service this evening. Today's Prime Minister led the tributes to one of his most iconic forerunners exactly 50 years on from the state funeral of Sir Winston Churchill. David Cameron joined politicians from across the party divide in a ceremony in the Members' Lobby at the House of Commons, in which he called him "a great leader and a great Briton". To honour the wartime leader, Churchill's funeral procession was re-enacted on the Thames with the original boat that carried his coffin. A fireman who travelled on Winston Churchill's funeral train has spoken of the "deep sense of sadness" after being reunited with the locomotive. James Lester was at the National Railway Museum in York today to see the reunion of the Winston Churchill locomotive with the parcel van that carried the statesman to his final resting place. The Battle of Britain Class steam locomotive and the goods van were restored for today's 50th anniversary and joined up with the luxurious carriage which carried family and guests. A wreath will be laid on a memorial stone in honour of Sir Winston Churchill during a private ceremony at Westminster Abbey this evening. 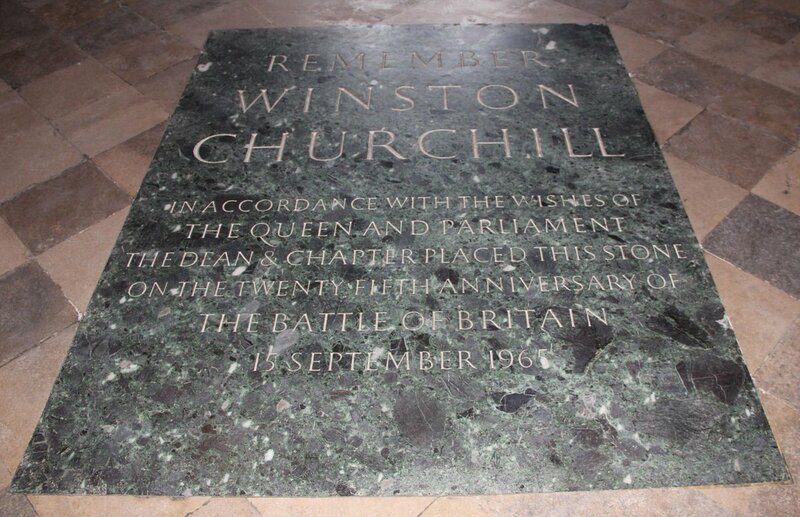 The memorial stone is made from green marble and lies just inside the west entrance to the Abbey, near the grave of the Unknown Soldier. It was dedicated by the Queen on 19th September 1965. The great grandson of Winston Churchill has said he is "proud" to be retracing the final journey taken by his grandfather on the Havengore 50 years ago today. Randolph Churchill, who was only two years old when his great grandfather died, said it was a "very special and unique moment".